My Pit Bull/Lab mix has suffered from allergies her whole life. At just one year old, after her second round of shots she broke out in hives and her face and body became swollen so we rushed to the emergency vet. Shortly after, the constant itching started in. We had tried everything our conventional veterinarian suggested including Prednisone (which she was on for about two years) and switching to a grain free diet. Unfortunately, we saw little change in our little girl. Then we decided to try something different and started seeing a homeopath veterinarian, Dr. Jonathan Wright, and he suggested this product right away. We began adding the Beta Thym in addition to some allergy testing where she came back allergic to dust, mold, grass, dairy, chicken, and rice. We obviously cut out the foods she was allergic to and tried to avoid the inhalant allergies as much as possible. We went through one bottle of Beta Thym and she was doing so well we just kept her away from the food allergies. For a year and a half she was doing well, but then in the fall of 2014 she started itching her eyes and face uncontrollably. We could even hear her up all hours of the night itching. So we called Dr. Wright back who again suggested the Beta Thym. We have now been giving her Beta Thym for two months, in addition to occasional eye drops and keeping her away from the food allergies, and she is doing wonderfully. She is sleeping through the night and has regained all of her fur. We will continue giving this supplement to our allergy-prone dog for the duration of her life. I can't imagine how miserable her life (and ours!) would be without this natural alternative to Prednisone. Because it is safe and effective, there is no reason to not give it a try if you have concerns about your own dog's allergies. I am beyond thrilled with Beta-Thym. My PitBull suffers from all outdoor allergies, since we have had him on this product he is back to being a playful puppy once again. He is no longer scratching himself to bits and chewing on his paws. I would highly recommend this product to all! Thank you so much for creating this product! My mini dachshound was having much difficulty breathing and finding a comfortable position to sleep. She sneezed a lot and had very little energy. The only thing we have changed in her diet is the addition of Beta-Thym. Her sneezing is gone completely, she is FULL of energy and now sleeps very comfortably. This product is really amazing. My terrier has allergies from the environment and Dr. Marty Goldstein (author of The Art and Science of Animal Healing) himself prescribed this remedy for my dog. It worked wonderfully to reduce the symptoms by 90%, so that the Dr. and I could work at the cause of the allergies and allow her body to heal completely. 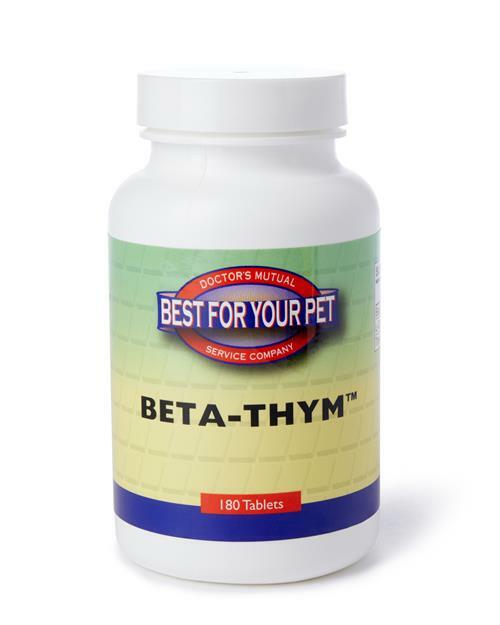 Betathym is basically a safe steroid that comes from a plant. No side effects like the chemical steroids. My dog acts like she SHOULD now...playful, happy, great mobility.